1. Light the barbecue (I like to cook this over wood, but charcoal or gas work fine) or preheat a griddle pan or an oven grill to high. Thread the tomatoes, shallots, chillies and garlic onto skewers (pre-soaked, if wooden) and cook over a high heat, moving regularly to ensure that everything is softened and lightly charred around the outside. Allow to cool slightly and, when safe to touch, remove and discard the chilli stems and the skins from the garlic and the shallots. 2. Bruise the lemon grass stalks in a pestle and mortar, then remove and discard the core and the tough outer sheaths. Chop the soft lemon grass within into small pieces. Put this and all the charred veg in a food processor with the tamarind paste, sugar, fish sauce and chilli powder. Whizz to a coarse paste (or pound in a large pestle and mortar). Add the lime juice and check for seasoning – it should be smoky, spicy, salty and sour. 3. Coat the steaks in the dark soy sauce and leave them out of the fridge for 10 minutes to come to room temperature. Cook the steaks on a hot barbecue (or griddle pan) to your liking – I go for rare, which takes about 2-3 minutes each side. 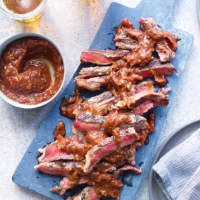 Rest the steaks for at least 5 minutes, then slice thinly and serve with generous helpings of the roasted chilli jaew relish drizzled over, plus extra on the side for dunking.